Power supply for PC, ATX-450W P4, 230VAC Power supply for PC ATX-450W P4, 230 VAC, power 450 W, cooling fan 120 mm. Switching power supply 12VDC, 2.1A, 25.2W, IP20, RS-25-12 Switching power supply that converts AC voltage to DC voltage. It serves to power devices that run on DC current. 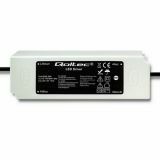 Switching power supply QOLTEC 50941, 3A/12VDC, 36W, IP67, constant voltage Compact, pulse QOLTEC LED power supply with 230 V input voltage, 12 VDC output, 3 A output power, 36 watts output power and IP67 degree of protection. Switching power supply QOLTEC 50945, 12.5A/12VDC, 150W, IP67, constant voltage Compact, QOLTEC pulse LED power supply with 230 V input voltage, 12 VDC output voltage, 12.5 A output power, 150W output power and IP67 protection. Switching power supply 1.5A/12VDC, 18W, IP67, LPH-18-12, MEAN WELL, constant voltage Mean Well (LPH-18-12) versatile pulse power supply with wide application and small size. 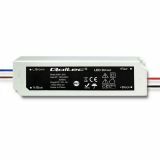 Power supply with nominal output voltage 12 VDC, nominal output current 1.5 A, rated power 18 W and protection class IP67. Switch power supply unit 4.5A/24VDC, 108W, IP20, LRS-100-24 Switching power supply that converts AC voltage to DC voltage. It serves to power devices that run on DC current. Switching power supply LPV-150-12, 10A/ 12VDC, 120W, IP67, constant voltage Compact, pulsed LED power supply from MEAN WELL with input voltage 180 to 305 VAC and 254 to 431 VDC, output voltage 12 VDC, output current 10 A and output power 120 W and degree of protection IP67. Switching power supply 8.5A/12VDC, 100W, IP67, LPV-100-12, MEAN WELL, constant voltage Universal compact pulse power supply with wide application and small dimensions. Power supply with nominal output voltage 12 VDC, nominal output current 8.5 A, nominal power 100 W and protection class IP67. Switching power supply 5A/ 12VDC, 60 W, IP67, LPV-60-12, MEAN WELL, constant voltage Universal compact pulse power supply Mean Well (LPV-60-12) with wide application and small dimensions. Power supply with nominal output voltage 12VDC, nominal output current 5A, nominal power 60W and protection class IP67. Switching power supply 3A/ 12VDC, 36W, IP67, LPV-35-12, MEAN WELL, constant voltage Universal compact pulse power supply Mean Well (LPV-35-12) with wide application and small dimensions. Power supply with nominal output voltage 12 VDC, nominal output current 3 A, nominal power 36 W and protection class IP67. LED power supply, 1.67A/12VDC, 20W, IP67, LPV-20-12, MEAN WELL, constant current Universal compact pulse power supply Mean Well (LPV-20-12) with wide application and small dimensions. Power supply with nominal output voltage 12 VDC, nominal output current 1.67 A, nominal power 20 W and protection class IP67. 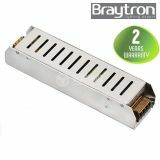 LED Power Supply 12VDC, 220VAC, 2A, 25W, IP20, non-waterproof, BY02-00250 Compact LED power supply unit from Braytron for general purpose applications with input voltage 230VAC, outpuт voltage 12VDC, output current 2A and output power 25W. Suitable for dry conditions IP20. Warranty period 2 years. List Price 7.90лв. VAT Incl. 7.50лв. VAT Incl. LED Power Supply 12VDC, 60W, 220VAC, 5A, IP20, non-waterproof, BY02-00600 Compact LED power supply Braytron for general purpose applications with input voltage 220VAC, outpuт voltage 12VDC, output current 5A and output power 60W. Suitable for dry conditions. Warranty 2 years. LED Power Supply 12VDC, 150W, 220VAC, 12.5A, IP20, non-waterpoof, BY02-01500 Compact LED power supply unit from Braytron with output voltage 12VDC, output current 12.5A, output power 150W. Suitable for dry conditions IP20. Warranty period 2 years. LED Power Supply 12VDC, 200W, 220VAC, 16.5A, IP20, non-waterproof, BY02-02000 The switching power supply unit transforms the electricity grid AC voltage into DC with lower rate. It has big efficiency, small size and weight. LED Power Supply 12VDC, 220VAC, 20A, 250W, IP20, non-waterproof, BY02-02500 Compact power supply unit from Braytron designed for general purpose applications with input voltage 230 VAC, outpuт voltage 12 VDC, output current 20 A and output power 250 W. Suitable for dry conditions IP20. Manufacturer warranty 2 years. 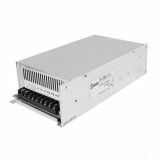 Impulse power supply 12VDC, 220VAC, 40A, 500W, IP20, S-500-12 Switch power supply unit for all purposes applications with input voltage 220 VAC, outpuт voltage 12 VDC, output current 40 A and output power 500 W. The product possesses an EMI filter, surge and overload protection . LED Power Supply 24VDC, 1A, 25W, 220VAC, IP20, non-waterproof, BY02-10250 The switching power supply unit transforms the electricity grid AC voltage into DC with lower rate. It has big efficiency, small size and weight. Pulse power supply (mini) 24VDC, 1.5A, 35W, IP20, VMS35-24 Compact power supply unit for general purpose applications with input voltage 230 VAC, outpuт voltage 24 VDC, output current 1.5 A and output power 35 W. The product has an EMI filter, surge and overload protection. LED Power Supply 24VDC, 2.5A, 220VAC, 60W, IP20, non-waterproof, BY02-10600 The switching power supply unit transforms the electricity grid AC voltage into DC with lower rate. It has big efficiency, small size and weight. Switching power supply units or for short - pulse power supplies are a new generation power sources that combine very high efficiency coefficient, compact size and light weight . Switched-mode power supplies( SMPS or a switcher) belong to the series of power supplies which are able to stand up and stabilize the voltage needed to power an appliance or device. In addition, they stand up and correct the current momentum and clear any interference in it. Among the technicians, they are known as key stabilizers which main principle is to maintain the output voltage value at a constant level. Switching mode power supply units convert the low-frequency current from the power supply network (50/60Hz) into a high frequency one ( 50 kHz), which provides a much higher power . This feature is combined with small and compact dimensions, and with far less weight than standard power transformer . The main advantage of switching power supplies is their high efficiency coefficient, which can easily reach up to 93% in most of the modern models. This leads to a reduction of the losses especially by reducing the emiited temperature and the heating. Less precised switching-mode power supplies (SMPS) produce heat and are additonally equipped with a fan to provide the necessary cooling.One of their disadvantage is that they emit high-frequency broadcast signals, which can lead to disturbances in the IT/ computer systems and more precise instruments and devices. Therefore, the impulse units have a metal enclosure, which absorbs the majority of these radiations. According to the application sphere, there are waterproof and non-waterproof switching power supplies. The waterproof power supplies can be used to power LEDs, LED tubes and LED strip lights. They also have a waterproof housing and a protection degree up to IP65, making them suitable for outdoor installation. Vikiwat Ltd. is a direct importer and distributor of a wide range of switching-mode power supplies (SMPS) and blocks, including models for DIN rail. We offer a wide variety of power supplies from 10W up to 800W. Here you will find a unique combination of quality , reliability and competitive prices!